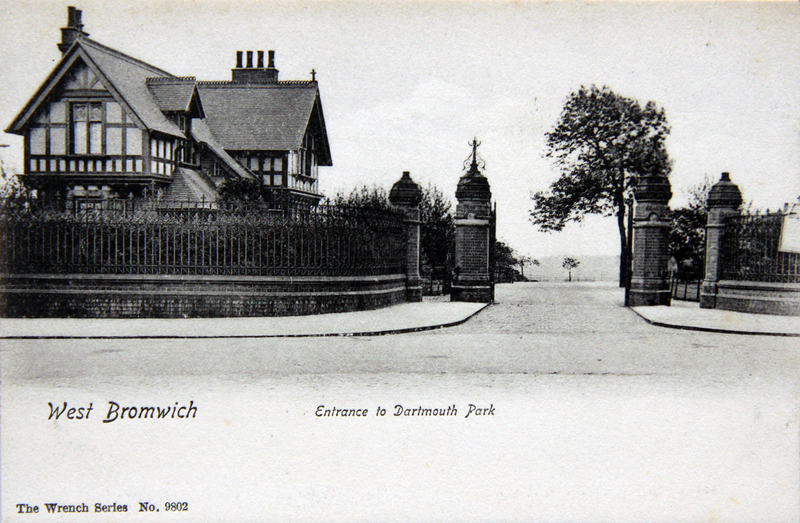 The Park was opened on 3 June 1878 by the 5th Earl of Dartmouth and Alderman Reuben Farley and attended by 40,000 people. The Earl, although holidaying abroad, replied almost immediately with a positive response. Boundaries were laid out for the park and in October 1876 the lodge design of a local architect, Mr E. J. Etwell was accepted. Budgets were set of £300 for building the lodge and £2,500 for laying out the park and an advertisement was placed in the Gardener’s Chronicle inviting landscape designers to send in designs. In January 1877, sites were fixed within the Park for a cricket ground, ornamental water, and the line of a drive or carriageway. 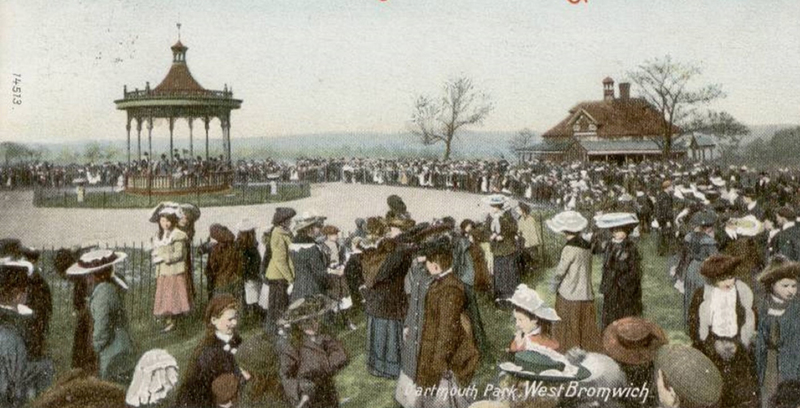 The Park was opened on 3 June 1878 by the 5th Earl of Dartmouth and Alderman Reuben Farley and attended by 40,000 people. It became the social life of West Bromwich. In 1887, the 6th Earl gave more land from his estate to extend the Park so that it could have a ‘pleasure pool’ and a swimming pool. The swimming pool wasn’t successful and became the much-loved Bowling Green. A beautiful boathouse was built and the boating pool was very popular with ‘courting’ couples as the young men wanted to impress their young ladies with their rowing prowess. 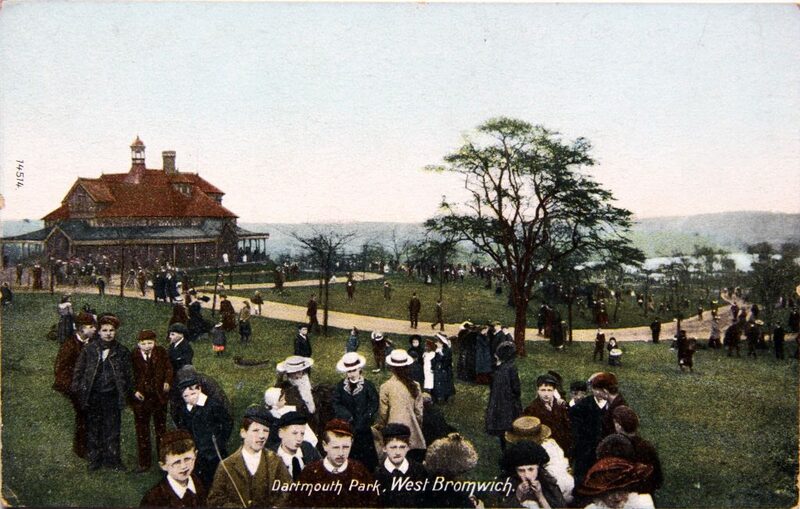 In June 1923 the then Prince of Wales visited the Park to present, on behalf of the 6th Earl of Dartmouth, the freehold of the Park to the people of West Bromwich, also meeting West Bromwich War Veterans. 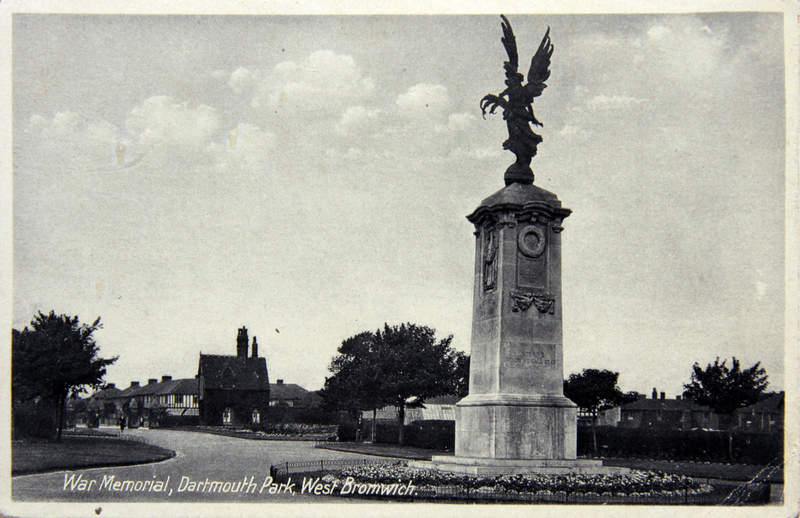 In August of the same year the iconic War Memorial was unveiled by the Earl. 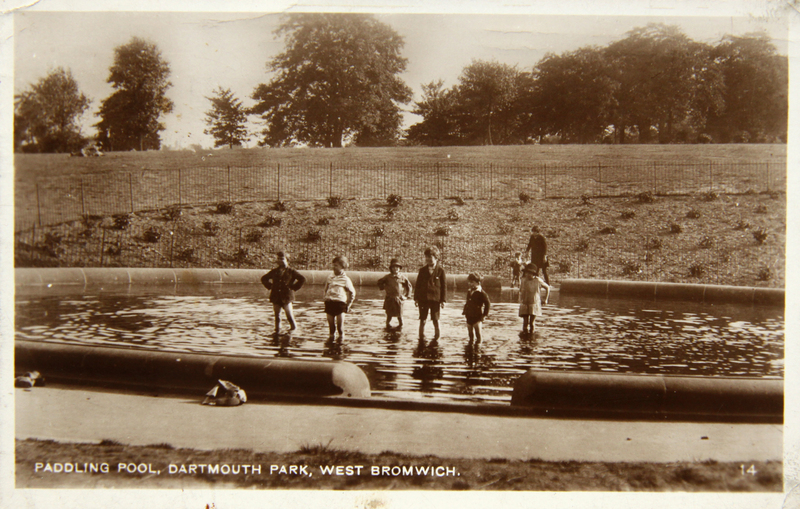 1928 saw the first paddling pool installed, which came from Drayton Manor – this was followed in the 1970s by a tiered water play area which, although popular, proved unsustainable. The play area was close to the Dagger Lane entrance and had a very steep slide which paid no attention to Health & Safety. On the other side of the Park near the Herbert Street entrance there were tennis courts and a putting green. 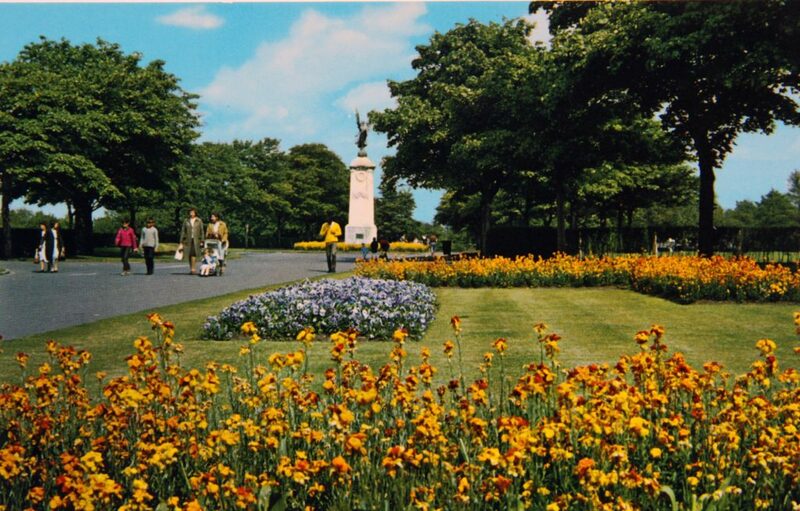 Over the years there have been stunning floral displays in the Park, but perhaps best remembered were the wonderful floral clocks. They were situated close to the War Memorial at the beginning and then moved to the triangular bed at the bottom of the Avenue. 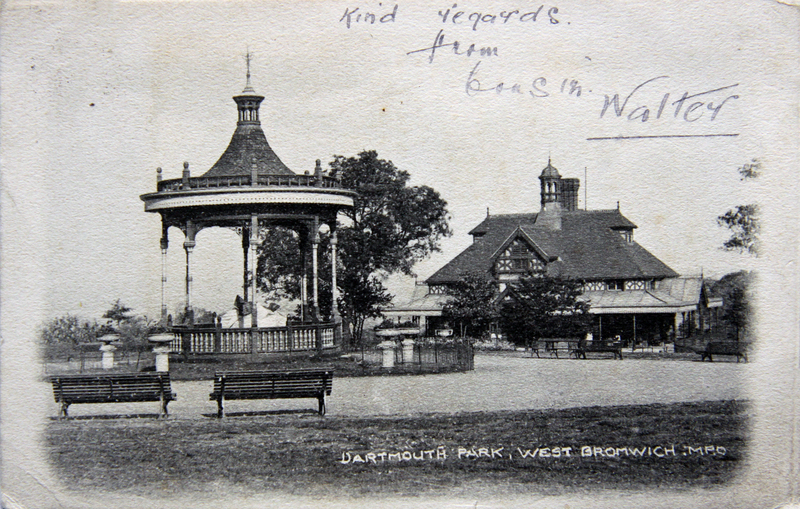 In the 1930s the Victorian bandstand was replaced by a wonderful Art Deco bandstand, which gave a lot of enjoyment to visitors to the Park. In the 1940s, Joe Johnson and his wife Florrie took over the running of the Refreshment Rooms. 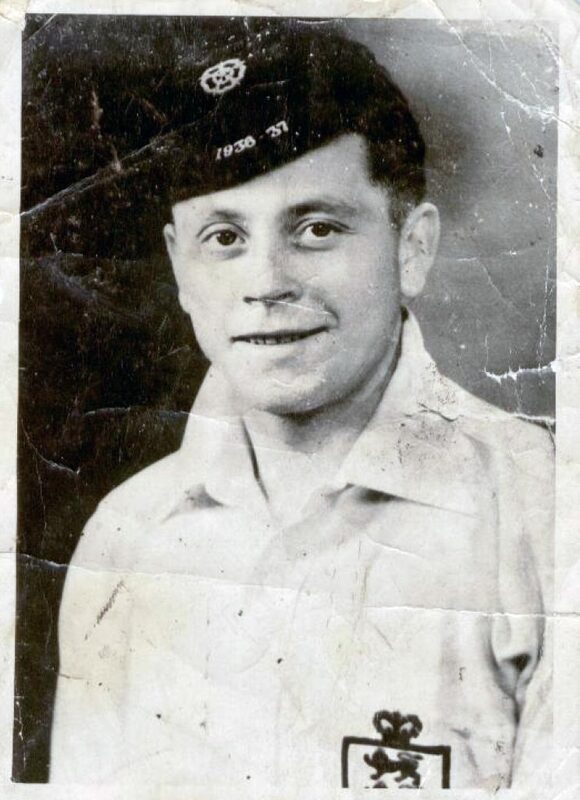 He was born in Grimsby in 1911 and his illustrious football career took him to play for teams in Scunthorpe, Bristol, and Stoke where he played alongside Stanley Matthews. He left Stoke in 1937 to play for West Bromwich Albion, appearing in 145 senior games and scoring 47 goals. After leaving the Albion he played for Northwich Victoria and Hereford United and was offered the job of Manager at Hereford, but he turned it down preferring to stay in West Bromwich to manage the Refreshment Rooms in Dartmouth Park. Joe was capped for England on five occasions. The Park remained very popular until the 1970s when the Expressway was built which cut off the Park from the town. It slowly went into decline and then the beautiful Refreshment Rooms and the Boat House were burned down by vandals. The art deco bandstand was left to decay. 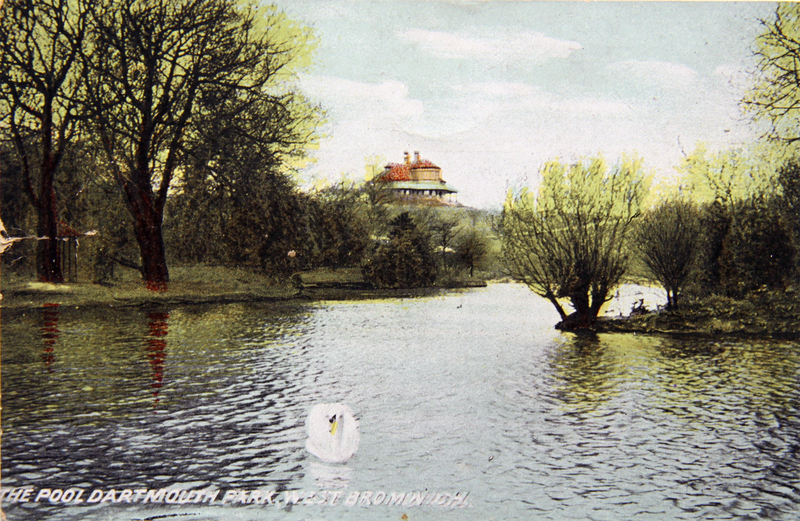 With the development of Sandwell Park Farm as a visitor centre the Park was neglected and became uninviting for the people of West Bromwich. 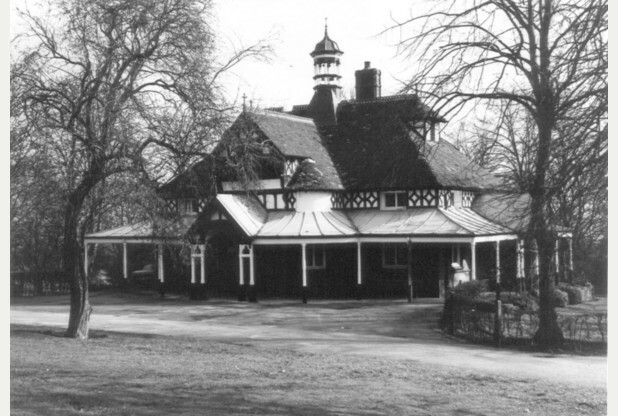 In 2009, Dartmouth Park received Heritage Lottery funding, which together with funding from Sandwell MBC amounted to the sum of £6.4million and the restoration of the Park began. The official launch of the restored Park took place on a very wet Saturday in September 2014 and it is once again part of the social life of West Bromwich. 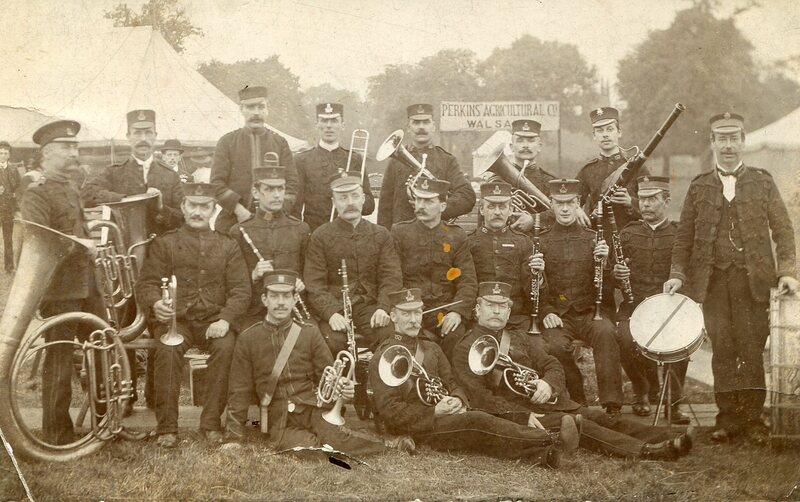 Dartmouth Park Military Band c1905. 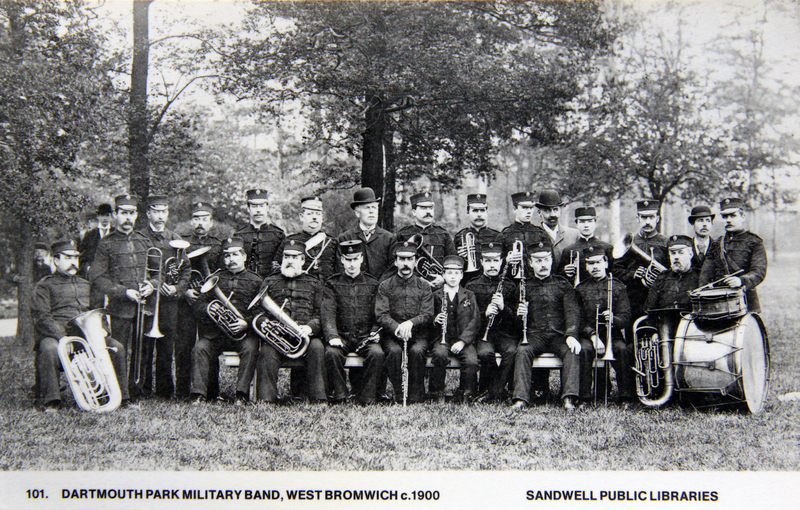 Jack Wilson with Clarinet in the centre of second row. Submitted by relative Tony Fleming. 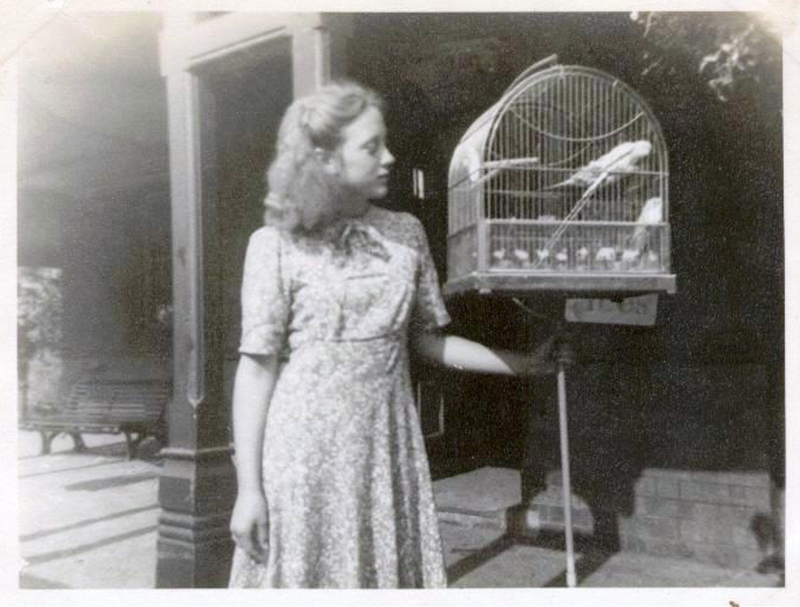 Shirley Flood nee Johnson outside the refreshment rooms in 1948 with the famous Hill Mynah bird Joe Johnson taught to say very loudly ‘Up the Baggies’. 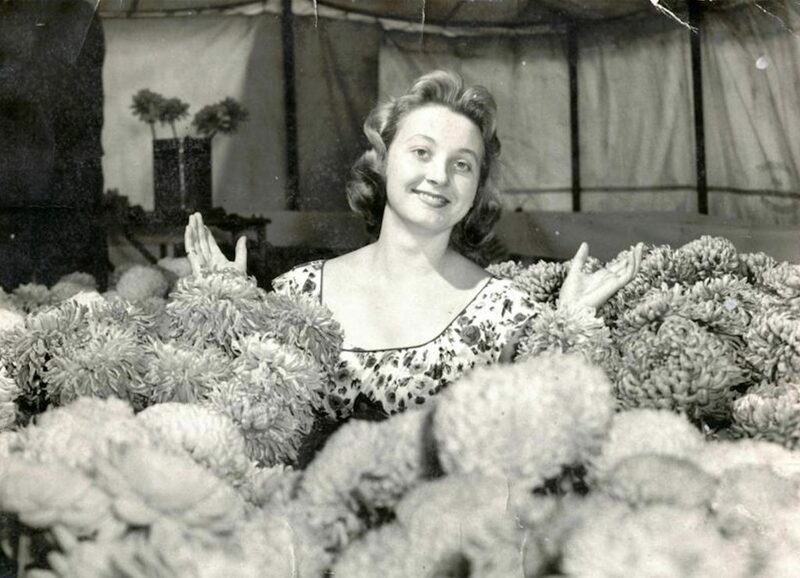 A lovely photograph of Josie Johnson standing amongst the blooms in the Floral Display Tent at one of the Horticultural Shows in the late 1950s. 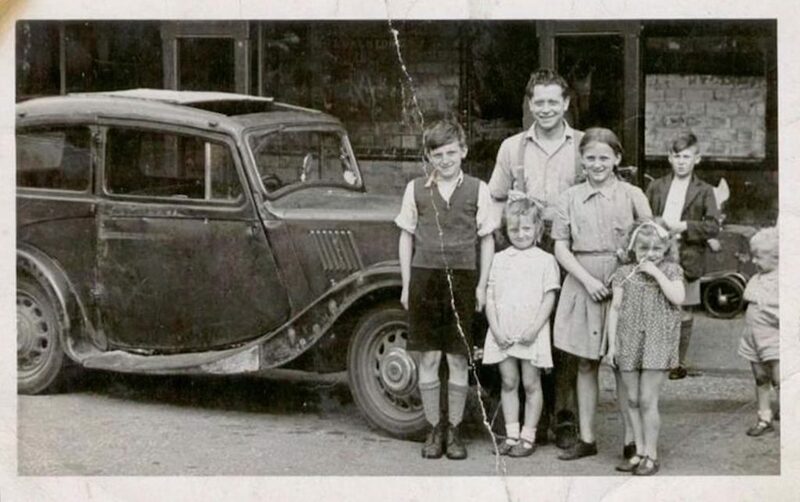 Joe Junior, Joe, Josie and Shirley outside the Refreshment Rooms standing next to the car Joe purchased with his testimonial money from Stoke City. A beautiful boathouse was built and the boating pool was very popular with ‘courting’ couples as the young men wanted to impress their young ladies with their rowing prowess.